In the last few months I’ve helped few clients with their product’s launches. In all this projects, I’ve worked with a lot of things that are not my expertise, which is good because I’ve learned a lot and for those who don’t know me, I always try to learn as much as I can. Anyway, this week I’ve expended most of the week trying to find ways to speed up the loading time of some videos. Video editing isn’t my expertise, but I know the basics and I like to think that all the applications have something in common, options, edit, delete, undo, redo, save, and exit. At least I knew the basics and lucky me, in the last few months I took some time to read about flash and the future of video in the internet with HTML5 jumping into the market. Going back to my client’s problem, and since I’ve rarely said no to a challenge (this is not good by the way), I’ve expended a lot of time(you see why is not good) to solve the issue, without spending a huge amount of money in software. First Challenge: Split the videos! My client had four hours of videos in WMV, the majority 1Gb files, so loading that in a browser was not a good idea. My first idea was to split all the videos in a smaller videos between 10 to 20 minutes, instead of 30 to 60 minutes videos. My first option always, sourceforge.net is the first place to look around when I need to find a free and good software. Unfortunately I couldn’t find a free software to do this, I had to To look for a different solution. I found this software “SolveigMM Video Splitter” to split the videos. This application has a trial of 21 days, I’ve only used two days of the trial for this project and I don’t know if I’ll buy it, because to be honest, I don’t think I’ll use it again, but is very simple and it works really well, so I definitely recommend it. (In the end, I found “WM Converter 2”, but I haven’t run a test yet). 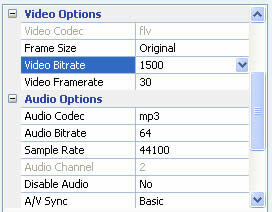 After I split the video in few parts, I still had 400 MB videos to reduce to under 60MB, to be able to use it online. The best way to accomplish this, is to convert the videos from WMV to FLV. Amazingly, I was unable to find a solid open source software to do the video conversion. CNET was the next solution available, I checked a lot of their applications, but most are 15 days trials with limited options and you lose some video quality during the conversion. After tons of installers and uninstallers of trials, I ended up with this one “Any Video Converter”. This application is really easy to use, it does the job quite well. all the videos are between 40 Mb to 60MB, without losing quality and they are converted fast (although that will depend on your computer). I hope you like this post, any tips you that want to give, please let me know I’ll like to update this post with more information. Also, I this post help you in any way, please share it with your friends, thank you. Excellent share! I’ll try this and see if it works. i have a 55 MB (wmv) video and I want to reduce it’s size to 20MB, is there a software I can do it with? it’s a school project, I can’t cut or spilt the video or convert it to flv. I have been using easy video converter for a while and it works really well. I had some issues converting directly to FLV. So, what I did was to convert the file to mp4 and then rename the file to flv (change teh name “filename.mp4” to (filename.flv). It works because they use the same codec and online any player plays the flv extension without issues and sometimes doesn’t work for mp4 (weird I know). That’s a great list. Thank you very much! I love the software ‘Any Video Converter’ … I am so impressed with it… Thanks for this post. Really helpful. Although these are things I already knew, I dint even think of applying them.. Thanks a ton..
You’re welcome. I’m glad that could help.